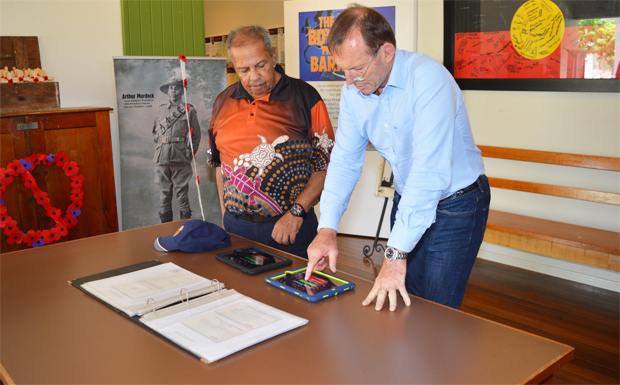 The Federal Government’s “special envoy on Indigenous affairs”, former Prime Minister Tony Abbott, paid a quick trip to Cherbourg on Thursday morning. 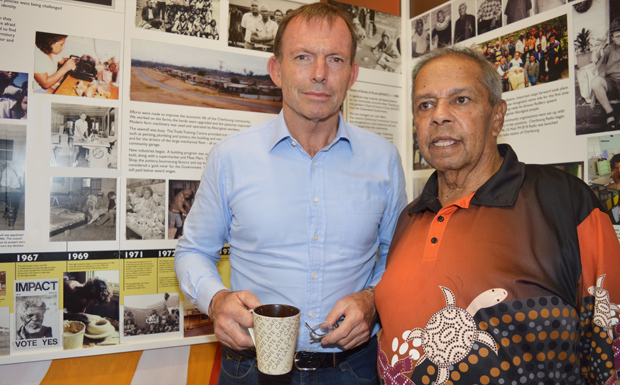 Mr Abbott, who was accompanied by Member for Wide Bay Llew O’Brien, had a meeting with local Councillors, visited Cherbourg State School and then enjoyed a guided tour of The Ration Shed by Wakka Wakka Elder Eric Law, AM. A small group of protesters greeted Mr Abbott outside the Council Chambers, including Alwyn Doolan who is part-way through his “Message Stick Walk” from Cape York to Canberra. The incident didn’t appear to faze Mr Abbott who said he would return to Cherbourg at some stage to hold a community meeting. 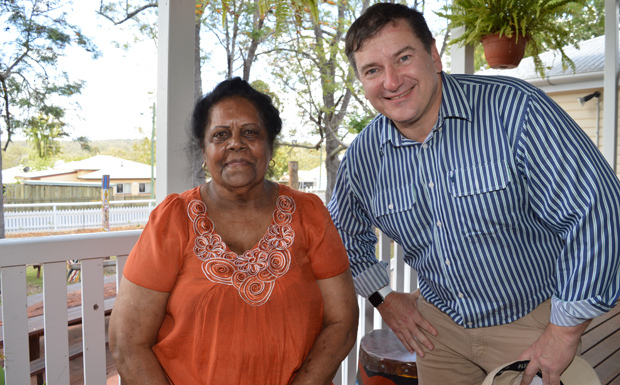 “Like every place in Australia, Cherbourg has its issues, but a lot of good people are doing wonderful things here,” Mr Abbott told Radio Cherbourg later. “I hope as a result of this trip, a couple of things might change for the better. Mr Abbott said there were “all sorts of things” he hoped would be followed up on after his visit. “In terms of transport, in terms of infrastructure, in terms of policing … let’s hope that next time I come, there’ll be some differences for the better,” he said. 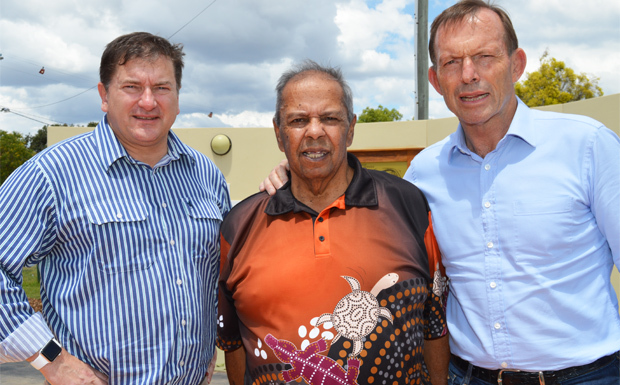 Uncle Eric told Radio Cherbourg he was pleasantly surprised by Mr Abbott’s visit. The former PM studied the time line on the wall of The Ration Shed, asking a number of questions about various photographs. 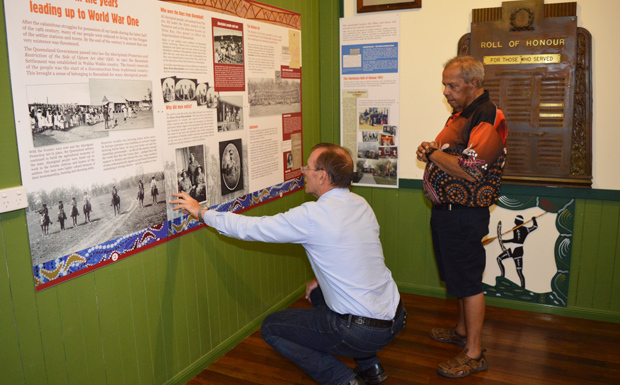 He then visited the Boys From Barambah exhibition, had a quick look inside the Boys Dormitory which is undergoing extensive renovations, and then inspected the War Memorial. “He was genuinely interested in the history of Cherbourg and he was very interested in the war memorial,” Uncle Eric said. He said it had been an opportunity for Cherbourg to get across its message “and I think he was listening”.